Over the next few weeks, The Region Reporter will share with you a series of stories about improving care and health through partnership and teamwork at the Lighthouse. These initiatives are underway thanks to the hard work of the Community Services Team (Team 1), which is part of our Ready Every Day: 90 Days of Innovation project. In the past two weeks, thanks to the services of an onsite paramedic, the Lighthouse has drastically reduced the number of people who require transportation to the hospital. The Lighthouse is a community-based organization that provides emergency shelter, supported living and affordable housing to those in need. 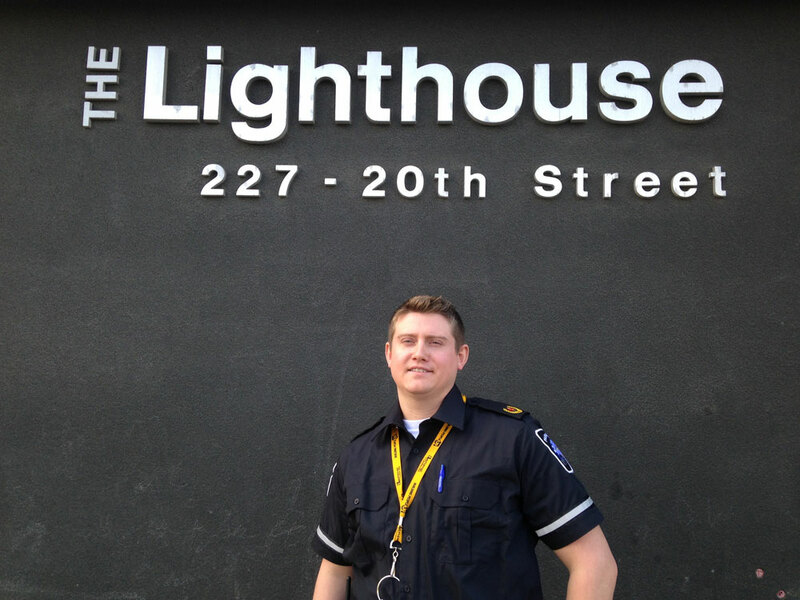 Mitchell Ehr is one of seven paramedics who is providing care at the Lighthouse as a part of a pilot project that resulted from the Region’s 14 Day Challenge. Since April 20, an onsite paramedic has been available to provide care to clients 12 hours a day seven days a week from 11 a.m. to 11 p.m. The initiative is part of a six-month pilot to expand services and hire new staff at the Lighthouse, with the goal of reducing the number of monthly admissions to hospital from this location. Mitchell Ehr is one of seven paramedics at M.D. Ambulance who has joined the Lighthouse staff for this initiative. Ehr says patients who experience minor emergencies have needs that can be better met onsite by a paramedic than in an emergency room, where wait-times can exceed five hours. “Let’s say there’s a patient with a cut on their arm,” explains Ehr. “The Lighthouse staff calls 911 and an ambulance is dispatched. As the onsite paramedic and first responder, I then assess the patient to decide whether this person needs care in the hospital, as opposed to just sending them there because the resources aren’t in place to support them in the building. Over the past year, ambulances have been dispatched to the Lighthouse approximately 40 times per month. “It really speaks to the need of having a paramedic onsite who can triage appropriately and provide care as needed in a timely fashion,” says Dave Thiessen, General Manager at the Lighthouse. Having a paramedic onsite also means clients have access to follow up care if required. “Because we now have a paramedic onsite, we can provide consistency of care and make sure care plans are being followed,” says Thiessen. “Our clients deserve to get adequate health care and to have their needs met. See the www.saskatoonhealthregion.ca/ReadyEveryDay website for more information about 90 Days of Innovation: Ready Every Day.